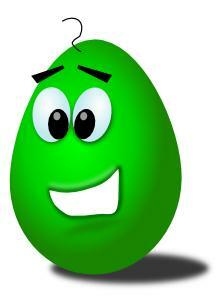 Dino Egg or Alien Artifact? Is it a fossilized dinosaur egg? Is it a giant penguin egg from another era (or planet)? What can it be?!?? Why, it’s actually a fine opportunity to learn a little something about the geological wonder called concretions while you earn a smilie for an Earthcache! Concretions are a geological curiosity that have mystified and intrigued scientific minds since the 18th century. They have been posited to be dinosaur eggs, animal or plant fossils, bizarre human creations, or even extra-terrestrially-based in nature. But what *ARE* these large, often spherical or egg-shaped objects, really? The word 'concretion' is derived from the Latin con meaning 'together' and crescere meaning 'to grow'. Concretions are typically formed through a process where a nucleus or center of organic matter, such as a leaf, tooth, piece of shell, or fossil, is covered by layers of minerals through concentric growth meaning that the originating matter is surrounded by successive layers of minerals which accrete or adhere to the center object. This process results in increasing the radius or size of the concretion over time. Snuggly Kitten and I like to think of concretions as the "pearls" of the geological world as they are formed in a similar method, only through Mother Nature's efforts rather than through oysters creating the layers. While concretions can contain a fossil as the nucleus or as a component they, themselves, are not fossils but are commonly composed of calcite, silica, or hematite. They can be composed of a number of other different minerals as well and typically are very similar in color to the rock in which they are embedded or created. and cannonball-sized concretions in California, New Zealand, Greenland and China, among other places, right here on Earth. 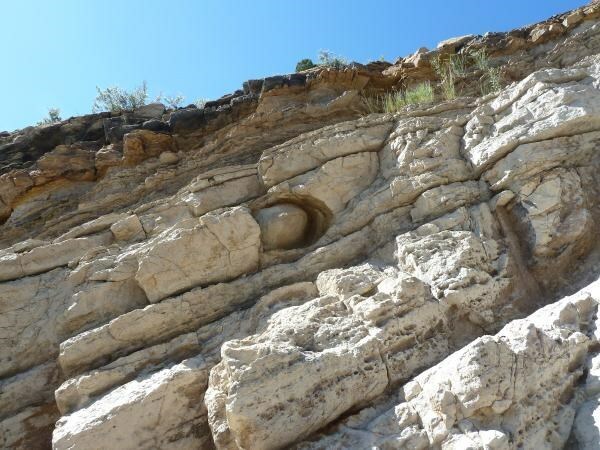 Many times geologists or paleontologists crack concretions open to see if there is a valuable fossil at the center ~ sort of the geological equivalent of "how many licks does it take to get to the center of a Tootsie Pop"? If it were me, I'd prefer to utilize an MRI or other technological method to "peek inside" and ensure that whatever formed the center was truly worth justifying the destruction of the unique creation. 1. What size is the concretion located at these coordinates here on Dinosaur Ridge? 2. 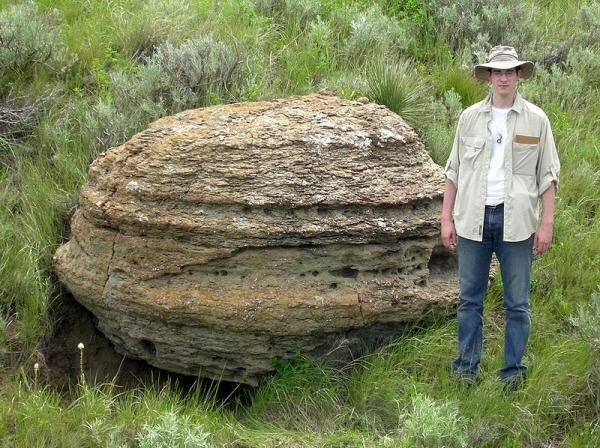 How far from the ground do you estimate this concretion is located? Obviously, no Internet search answers will be accepted and logs that are not accompanied by an addition to the gallery photo and an e-mail with the correct answers will be deleted from the cache page. We hope you have fun and enjoy learning a lot about this geological marvel ~ we certainly did!